My SECRET SANTA which I have been waiting for in the mail has arrived!!!! Since time began, there have been Nightwalkers - the races of the night who live in the shadows of the moonlight. Love with humans is absolutely forbidden, and one man makes certain to uphold this ancient law: Jacob, the Enforcer...For 700 Years, He has resisted temptation. But not tonight...Jacob knows the excuses his people give when the madness overtakes them and they fall prey to their lust for humans. He's heard every one and still brought the trespassers to justice. Immune to forbidden desires, uncontrollable hungers, or the curse of the moon, his control is total...until the moment he sees Isabella on a shadowy New York City street. Saving her life wasn't in his plans. Nor were the overwhelming feelings she arouses in him. But the moment he holds her in his arms and feels the soft explosion of her body against his, everything changes. Their attraction is undeniable, volatile, and completely against the law. Suddenly everything Jacob has ever believed is inflamed by the heat of desire...Bring on the night. Source: Info in the Jacob by Jacquelyn Frank was taken from amazon at http://www.amazon.co.uk/Jacob-Nightwalkers-Jacquelyn-Frank/dp/0821780654/ref=sr_1_1?ie=UTF8&s=books&qid=1261219872&sr=1-1 on 21/12/09. 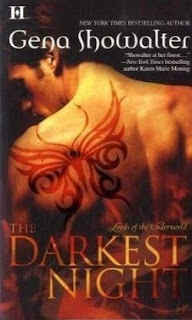 Source: Info in the The Darkest Night was taken from the author's website at http://genashowalter.com/lotu/the-darkest-night/ on 21/12/09. 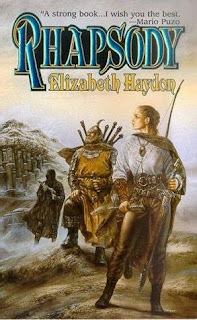 In RHAPSODY Elizabeth Haydon tells a story that encompasses a world and centuries of time and which introduces three characters who have already captured a new generation of fantasy fans in the US. They embark on a journey through the centre of their world only to reach its end and find that centuries have passed and the land faces the awaking of a demon. Haydon's world building is unusually well thought out and vivid, her magic system is rigorous, her battle scenes realistic and massively exciting. But it is her characters, the intelligent and resourceful Rhapsody, the enigmatic assassin Achmed and the gruff but dependable Grunthor that have captured the imagination and affection of thousands of readers. This is a trio of characters who will carry the first great fantasy series of the 21st century on their shoulders. Source: Info in the Rhapsody by Elizabeth Haydon was taken from amazon at http://www.amazon.co.uk/gp/product/0575072792/ref=sib_rdr_dp on 21/12/09. Awww, Cherry! That is awesome!!! Happy Reading to you honey! And of course, have a blessed, merry Christmas!!!!! Great Secret Santa gifts. I'm about to do my own post for my presents that just arrived. Happy Reading, Cherry! Great presents! Enjoy! We just got ours too. So fun! Hot stuff! Hope you can handle it! What did you think of Rhapsody? It is one of my favorite fantasy series.